Self-assured and self-effacing, New Yorker Matt Keating surfaces with another memorable disc of apparently effortless pop. With his ear for great melodies and classic songcraft, it's small wonder that so many of the songs sound or feel familiar. You know what it's not? Edgy. A lot of what crosses a reviewer's desk promises to be edgy, which is supposed to be good news. 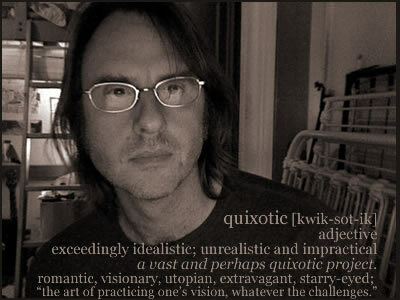 Quixotic is round, and fat, and analog-recorded. Even when Duane Jarvis is tearing it up on the Les Paul and the Marshall, the sound is very smooth, like an old Stones record. The artist and co-producer Adam Lasus have done a very impressive record, not only in its fidelity, but in the arrangements and the mix that each contribute a lot to the magic. Keating's appealing baritone is sometimes reminiscent of Lou Reed, other times of Peter Case. His singing is easy to listen to, and easy to believe. He's married to another singer songwriter we like, Emily Spray. They live in the West Village in NYC; he writes and records, plays dates, and coaches songwriting. This is his sixth release, all of which have spawned the accolades of national press, especially Tilt-a-Whirl. And Quixotic is already drawing raves of its own. His writing draws comparisons to Ron Sexsmith, and two bandmates of Ron's show up here: Jason Mercer on bass and Don Kerr on cello and backing vocals. What makes the comparison credible is that there's not a bad song on this 23-song double disc.